A cluster of stone cones set in one of Mount Royal’s more secluded areas. 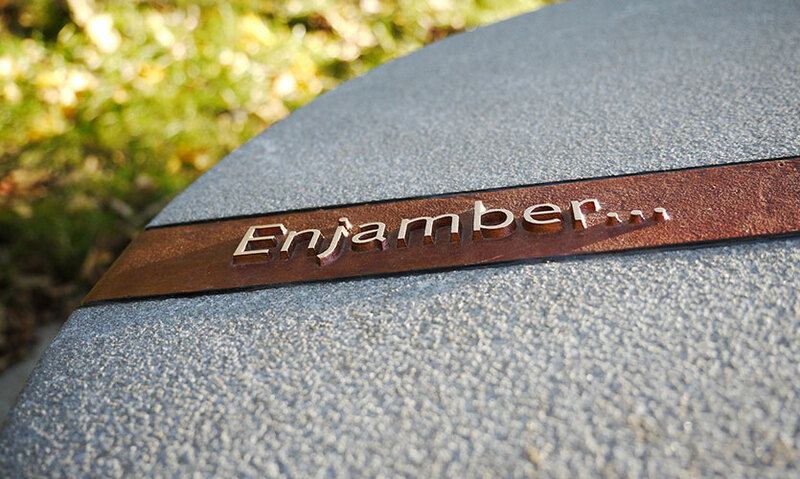 Bronze inscriptions compose a sentence which reads: Tread… on the landscaped ledge… of an underground reservoir. 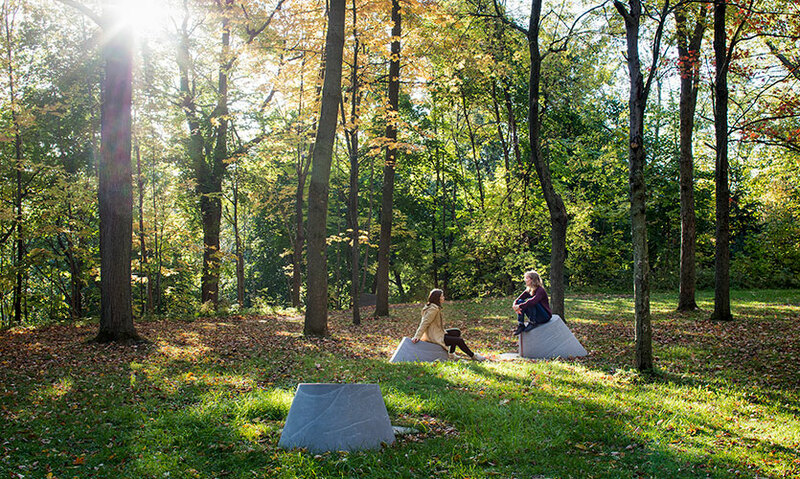 Cones are grouped in varying geometries as they adapt to their specific location; these soft wayfinding devices help visitors take in their natural surroundings and understand the site’s history. From the base of the mountain to its three summits, 25 stone clusters provide visitors with clues to the surrounding landscape or historical events of significance. 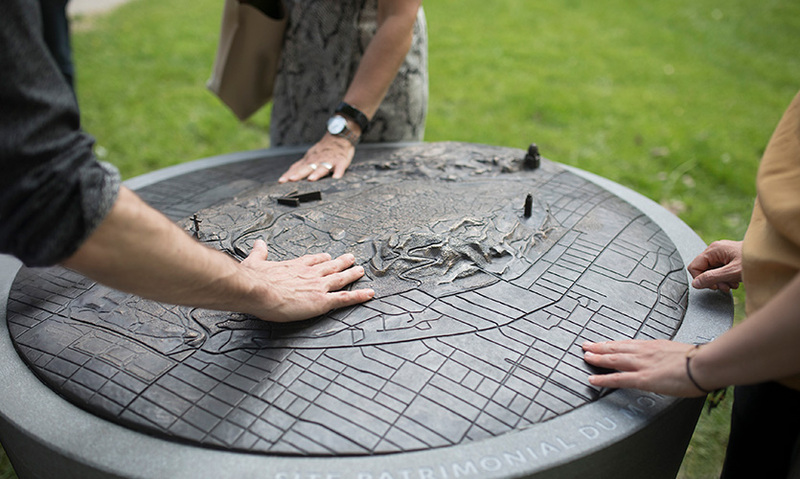 Topographical bronze maps, set on stone, signal the various accesses to the Heritage Site; 12 maps help visitors situate themselves, navigate and get an overall understanding of the territory. Maps identify each of the summits as well as three of Montreal’s well-known landmarks; they are highly tactile objects that support intuitive navigation through an extensive territory. Halts, or small in-situ belvederes, were designed for ten significant locations; they feature granite borders, which act as thresholds, and seating to take in the mountain’s interior views. Visitors are invited to stop at the halts, enjoy the views and reflect on poems written specifically for each of the locations; the words are set in bronze letters along the stone borders. 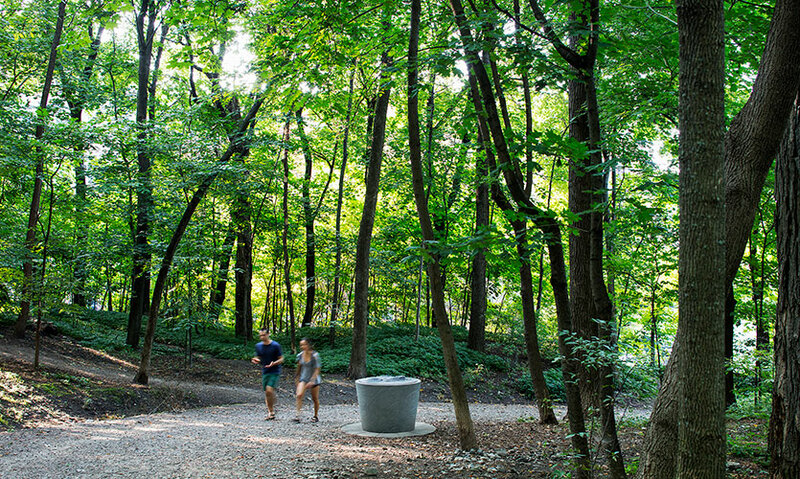 Mont-Royal Park is a cherished cultural landscape and an important destination for Montrealers and tourists alike. For over a hundred years, the protection and celebration of the mountain has been an essential community and municipal objective with many constraints, public-private dynamics and development pressures. 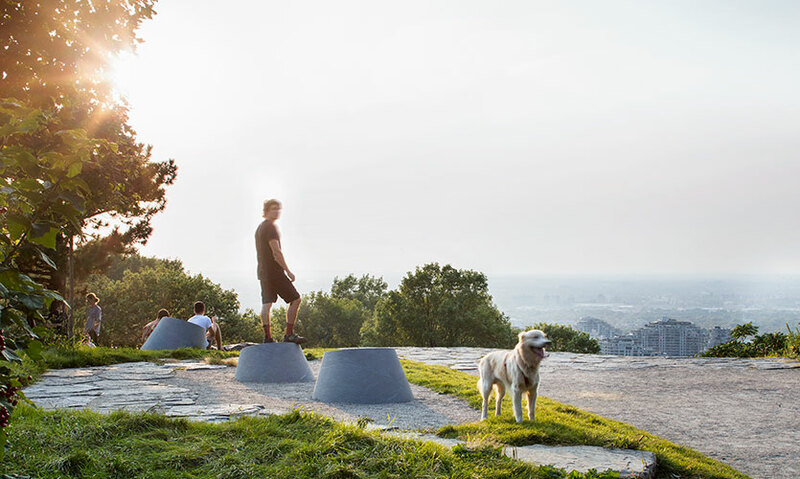 To celebrate the 375th anniversary of the founding of Montreal, the goal of Escales découvertes was to make the Mont-Royal mountain and the larger Mont-Royal Heritage Site more accessible physically and in terms of awareness of its rich architectural and landscape history. The project was to further the public cognizance of the important natural and cultural characteristics of the territory, which includes three summits, five cemeteries, two university campuses, several hospitals and significant urban and architectural neighborhoods. Initially, the project called for a multidisciplinary landscape, signage and wayfinding approach. A major pragmatic challenge was the size and area of the environment to be celebrated within a relatively small budget. A second challenge was related to the strong heritage protection afforded the territory and the complex stakeholder approval process, which often makes contemporary design initiatives difficult. 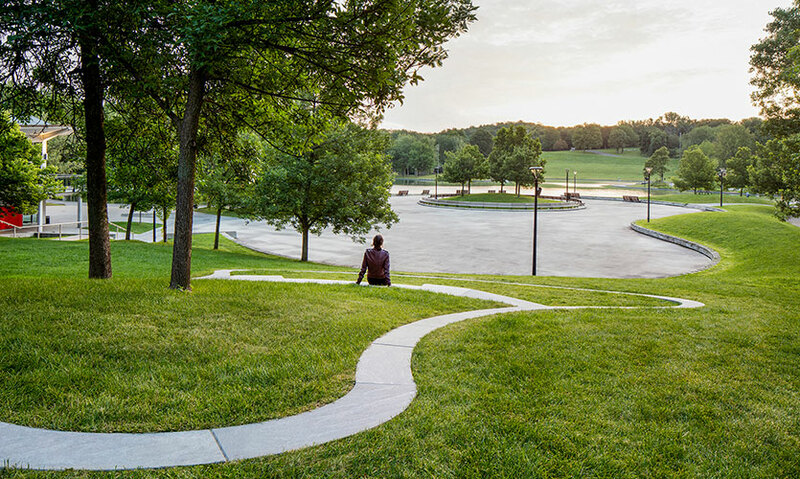 Staying away from traditional wayfinding options, such as linear trails, directional signage or commemorative markings, the designers opted instead for an open-ended approach using mostly natural features as wayfinding clues. A family of objects was developed in keeping with requirements deriving from the site’s special heritage status. Designed in granite and bronze, they are installed throughout the park and its immediate surroundings. They are meant to engage visitors in a sensorial and intuitive discovery of the site’s features. Three types of objects were created: tridimensional maps designed as orientation devices, low conical stones serving as markers in the landscape and larger belvedere-like halts. The bronze maps, each set on a granite base, were strategically placed at twelve access points. Each map clearly identifies Mont-Royal’s three distinct summits, rising above the city grid, and three built landmark icons. Together they provide visitors with a visual and tactile understanding of the mountain’s geographical identity. The cones, clustered in groups of three, vary in size, some as small as stepping-stones, others large enough to sit or lean on. 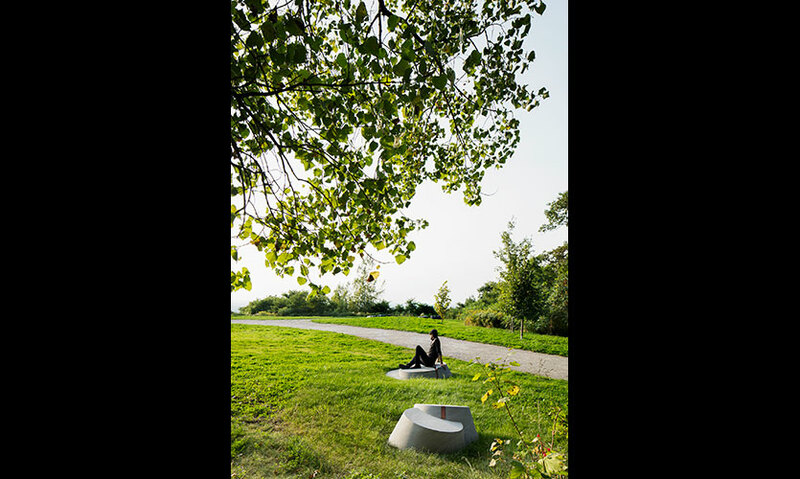 With their bronze inscriptions, they provide clues to the history or identity of the nearby landscape and trigger a multi-sensory experience. Twenty-five of these unique cone clusters were installed on the mountain. The last segment of this family of objects consists in a series of ten landscaped halts. 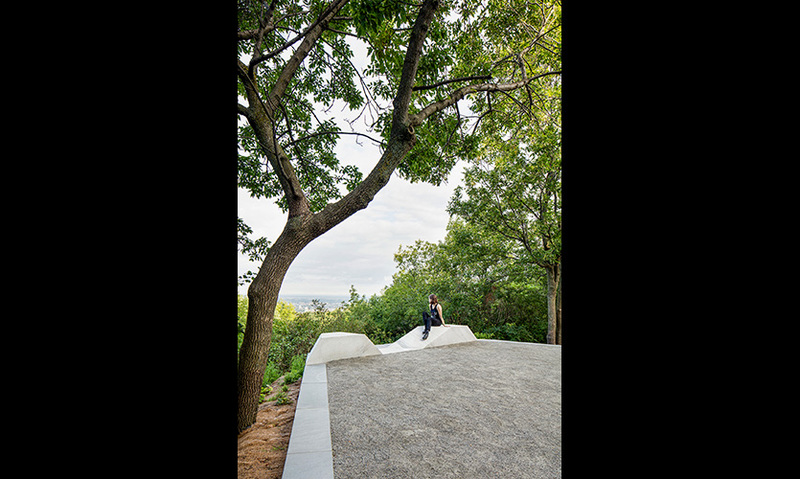 Each one, whether anchored in the ground or projecting from a cliff, is defined by border-like granite components featuring a one-line bronze poem written specifically for each location by an assigned Montreal poet. The halts, at times curvilinear, at times angular, all with built-in seating, are located in strategic locations with privileged views of Mont-Royal’s interior landscapes. Immersive and engaging, Escales découvertes invites Montrealers and visitors alike to continually renew their experience of the mountain through a fuller understanding of place. "A delightful and engaging experience integrated gracefully into the environment." "Wayfinding and interpretation suggested and implied without imposing. Beautiful." 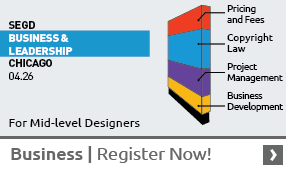 "The wayfinding is highly considered and blends seamlessly with the natural environment."